Oh, Pinterest, how do I love thee? Let me count the ways. I LOVE Pinterest, and I spend far too much time on the site, jumping from category to category. But even I have to admit that while the site can be a tremendous resource for artists, it can also be a little overwhelming. Consider the words of a friend of mine who posted on Facebook: "I signed up for a Pinterest account today. I have no idea what I am doing or how it works. A few of you have already sign up to "follow me" but, I think I should tell you... I AM LOST!" Don't panic, dear friend, help is available. And, once you know the basics, you'll be amazed at all the ways you can use Pinterest to enhance your creative life. Pinterest allows users to upload, save, sort and manage images, known as pins, into collections known as pinboards. You organize these boards into categories so that pins can easily be organized, categorized and discovered by other users. To learn the basics, I recommend the tutorial at WikiHow. Saving trees. Getting organized. Before Pinterest, I had bulletin boards, file folders and notebooks crammed with pictures, articles, and tutorials that I had copied from the Internet and printed out. Now I simply hit the Pin It button whenever I find something that I would like to reference again. Because I categorize each image as it is pinned, everything is beautifully organized from the get go. No more fumbling through stacks of paper for that photo that I misfiled. Getting Inspired: I use Pinterest to find inspiration when my mojo is missing. I keep Pinboards with my favorite art journal pages, craft projects, artist trading cards, color combinations, etc. When I set up my new studio, I used Pinterest to get ideas, and when the project was completed I posted the photos to inspire others. Discovering New Artists. I also follow artists and other pinners who are interested in the the same topics that I am. How does this work? Simply, go to SEARCH and type in the name of an artist or a topic. When you find a board that you like, hit the FOLLOW button. From that point on, you'll see anything pinned by that person on your Pinterest home page. Because pins link you back to the original post, you can click on them to discover new blogs and new artwork. Sharing your work. Pinterest is one of the fastest-growing resources on the web. 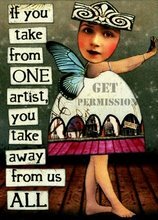 And, it's full of peope who love to create and purchase art. By posting your art and linking it up to your blog, store, or Etsy site, you can increase traffic and create new customers. Making New Friends. After a few months on Pinterest, don't be surprised to discover that you have found a new soul sister (or brother), someone who seems to share your tastes and interests to a surprising degree. Don't believe me? Then explain the follower who shares my passion for digital art, art journaling, Paleo recipes, and party planning. Do you have a Pinterest account? Leave a comment, and link us up so that we can follow you. You can check out my pinboards here. There's been enough interest in doing an Artist Way workshop that I've set up a special forum at Digital Art Quirks. You can check it out here. This is not just for paint and canvas artists or digital artists. It's for everyone who wants to explore their own creativity. So, if you're a writer, a musician, or an employee that would like to be more creative on the job, feel free to join us. One of the nice things, maybe the only nice thing, about being ill is that you can play on your computer without guilt. So, stuck indoors with a really nasty sinus infection, I have been working on all kinds of art projects. Over at Scrapbookgraphics, we're being inspired by the work of Elaine Brady Smith, a Pennsylvania-based artist who specializes in collage and mixed media work. You can learn more about her and see her work here. Thanks, IndyBev, for introducing me to this new artist. Here's a piece I finished this morning, Mariposa. CREDITS: Birgit Kerr's Wellnacht paper; Meredith Fenwick's Sweet Notions paper; Christina Renee's The Original Grunge Papers; Flerg's Vintage Garden torn border; Berna Datema's Gunge Overlays 1; Traci Sim's Everyday Essentials: Trims; Manu's Happiness lace; ON Cardboards No. 1 butterfly; and Sausan's Verde rusty pin. Photo from ArtEZine. I've participated in two other challenges this week, both at Digital Art Quirks. Here's my interpretation, On Wings and a Prayer. The other was the Digital Art Quirks Quirkle Challenge. Each week, we take turns setting up challenges for other DAQ participants. This week was my turn. I challenged the Quirks to design a piece with 1) a movie star; 2) some alliteration (able ape abs, bossy buxom beauties, etc. ); and 3) a monotone color scheme (any color). It's been so much fun seeing what everyone has come up with. Here's my ATC, featuring the late Charlie Chaplin. We'd love to have more participants in these challenges, so please stop by and play along with us. If you have any questions, just drop me a note in the comment section, and I'll get back to you ASAP. Don't you just hate it when life gets in the way of creativity? And would someone please explain to me why, when life gets stressful, the first thing I give up is my art? It's the one thing I can count on to relieve stress, yet it's the first thing I give up. Does that sound like a sane act? All of which is my roundabout way of saying I'm sorry for being such a bad blogger. Credits: Sausan's Altered Artistry Urban Art paper; Taran Conyer's Lipstick Chic paper; and Berna Datema's Eye Love You Grunge Overlays. Kim Gabriel, my quirky co-host of the Frameworthy challenge at Scrapbookgraphics, has chosen the Zodiac Series by Carolyn Quan for our inspiration this week. You can check out Quan's gallery here. 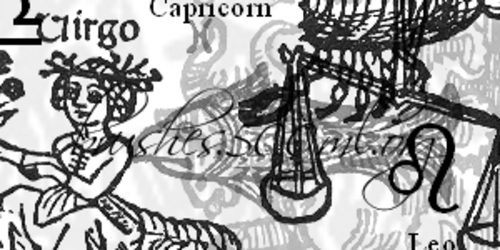 With a birthday in January, I will be trying to put together a Capricorn piece. Here's my Quan inspiration. I've been on the Internet looking for resources to use in my work. 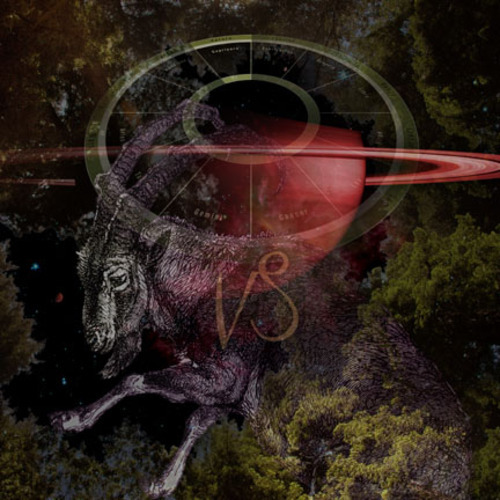 If you feel like playing along, you might want to check out these Zodiac freebies. Janita at Seishido.biz offers Written in the Stars Photoshop brushes, which includes large brushes for each sign. Kirsty at 500 ML also offers Zodiac brushes, featuring 24 different brushes. There are several fonts that focus on astrology, including KR Astro Font and AstroGadget. Both are available at Dafont. You can even download free Zodiac clip art at PC World. I'm really looking forward to seeing some out-of-this-world art in the gallery this week. 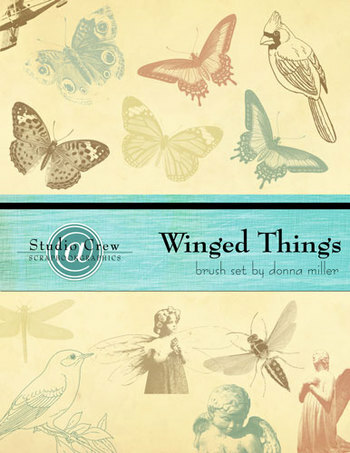 I'm so lucky to be one of the hosts of Scrapbookgraphics' weekly Frameworthy challenge. I love sharing some of my favorite artists with the challenge participants. This week, I selected the oh-so-talented Maggie Taylor as our inspiration. Taylor produces prints by scanning objects into a computer using a flatbed scanner, then layering and manipulating these images using Photoshop to create a surrealistic montage. The resulting work is full of vivid colors and magical images. I found my inspiration in her work Crazy Faith. The photo she used in this delightful piece reminded me of a similar photo of my great grandfather. Living in rural Kentucky, and trying to make a living during the Depression must have been incredibly difficult. I've entitled my piece, A Hard Day's Night. Photos of sky, landscape, and lightning from stock.xchng. Photo of building from Stephanie O'Neill's Simpler Days stock photo kit; overlay from Sausan's Pixies Overlays. Font is Goudy. The Stock Photo Challenge is back at Digital Art Quirks. The idea is simple. Members take turns choosing a stock photo for others to use in their art. Past challenge photos have included everything from melting ice cubes to mosaic tiles to rust. This week was one of the easier ones. The challenge was to use a photo of an old notebook, uploaded to stock.xchng by Stefanie. 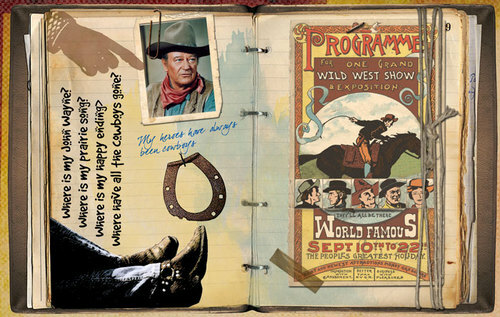 L.
I ended up doing an art journal page, using lyrics from the Paula Cole song, Where Have All the Cowboys Gone? Photos of journal, boots and horseshoe are from stock.xchng. All other papers and elements are from Kathryn Balint's Little Jake kit. If you'd like to participate in this week's challenge, you'll find the assignment here. Ruthpics outlined the parameters for last week's Quirkle Challenge at Digital Art Quirks. Create a 6x6 work using snow, wings, and an emphasized word of meaning to the creator. I've been thinking a lot about the word joy since my recent trip to Disney World. In the "happiest place on earth," I saw so many people who looked stressed, tired, and just downright angry. What a shame. Sometimes I fear that our society has lost its ability to find happiness in simple things. 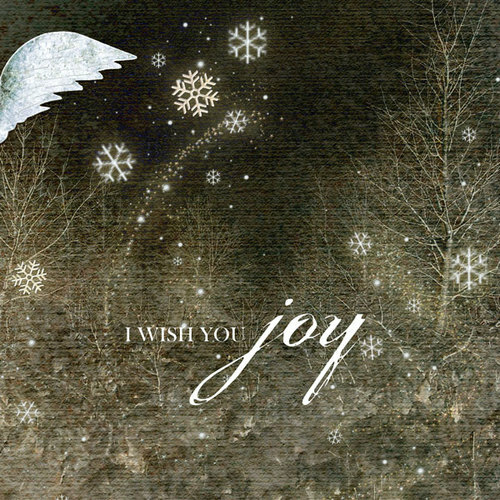 So that's what I'm wishing my blog readers and fellow Quirks: I wish you joy. Photo from stock.xchng; background paper (blended) and wings from Lie Fhung's Soaring kit; snowflakes and stars from Fhung's Lumoz Whimsy 2. Spanish surrealist Salvador Dali was as prolific as he was eccentric. 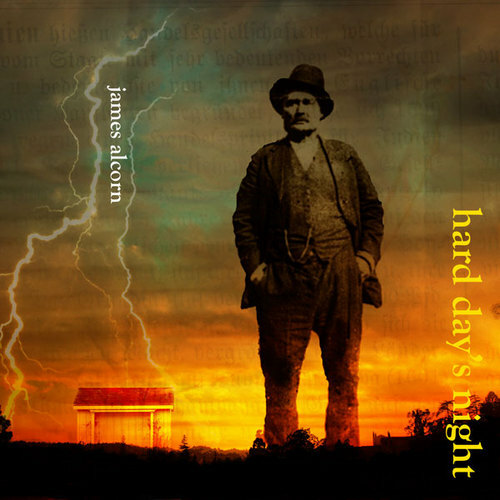 This week, he's the subject of our Frameworthy Inspiration challenge at Scrapbookgraphics. Virtual Dali, an online gallery devoted to his work, is one of the best art sites that I've ever come across. You could easily spend hours going from painting to painting. I took my inspiration from his famous painting, The Eye. My version is a little less severe, a little less quirky, but I didn't use hallucinogens to alter my reality, either. 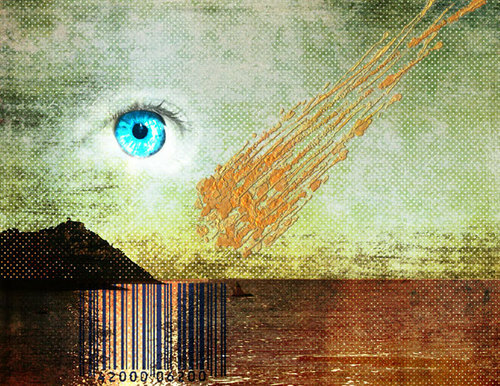 Background papers from Meredith Fenwick's Autumn Breeze Dotted Solids; photos of eye, sunset, and mountain from stock.xchng; barcode from Maya's Weird is Wonderful brushes; and paint from Lie Fhung's ArtiStroke's Soaring Strokes. Overlay from Berna Datema's Eye Love You Grunge Overlays. What a crazy weekend! Two of the sites where I hang out, KB & Friends and Scrapbookgraphics, were both hosting special events for Digital Scrapbooking Day. There were chats, special challenges, and gifts galore. It was a lot of fun, but by the time it was over, I was exhausted. Kim Gabriel and I hosted a special Frameworthy challenge and chat at SBG on Saturday night. 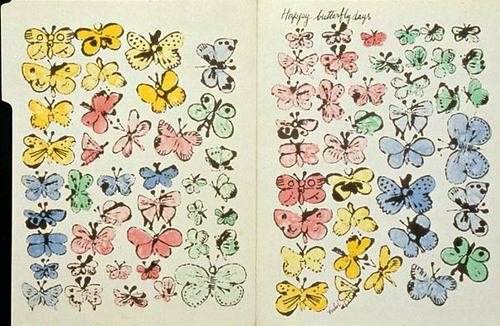 Our inspiration piece was one of Andy Warhol's butterfly pieces. I've got to admit, I was familiar with Warhol's pop art, but who knew he did pretty? 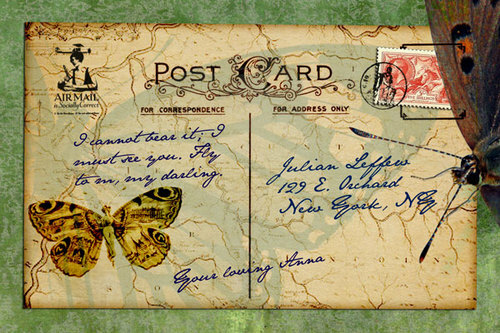 Here's what I came up with, a piece of mail art with all kinds of flying and butterfly references. Be sure to check out the awesome airmail stamp in the corner. Background and postcard from the SBG Gratitude kit; butterfly photo from stock.xchng; winged woman from Art E-Zine; butterfly stamp from my own Winged Things brushes; air mail stamp from Maya's Weird is wonderful; postage stamp from Outside the Margins; and postmark from Nancie Rowe Janitz's Bits of History brushes. Font is Jane Austen.